Been musing recently about getting older – not that I am anywhere near 60 as yet! BUT my mother-in-law, who lives here in Australia, is well past 60 and recently she has been struggling with lack of energy and stress. Her son (my husband) and I had a look at her diet and were appalled. Breakfast was 2 cups of coffee, lunch was a sushi roll and dinner, on a good day, was a small piece of fish and some veggie. This lady is tall, slim and elegant and I get that she wants to stay this way – but really, how did she think she was going to survive? The experts tell us that in normal people up to the age of 60 we need about the same weight in grams as our body weight. Thus a 60kg female who exercises in normal amounts needs about 60g pf protein spread evenly throughout the day. But this equation changes to a multiple of 1.1 over 60 – this means a 60kg lady needs 66g of protein. This is because it gets more tricky for older people to absorb protein from food as they age. It also helps if the protein they take in is in easily digestible forms such as whey protein. So we have taken our mother-in-law in hand and put her onto our wonderful whey protein enhanced meal replacement shakes. We now KNOW (because I control her orders) that she is taking in a minimum of 24g of protein at breakfast and the same again for lunch when she has her second shake. We cannot control what she has for dinner though with extensive coaching I am hoping she is catching onto the protein bandwagon but I bet her body is receiving already, from 2 shakes, 6 x as much protein as it was before we started her on the programme. And guess what – she is still tall, slim, elegant but now with oodles more energy – simply by changing her diet in a very small way. And her story is not unique – I have seen other similar stories from people on the same programme – some see their parents lose the weight that has burdened their body for years and some see, concurrent with this weight loss a change in health and a decrease in the amount of medication required by the older person. The photo shows a 73 year old lady that lost 17kg over 4 months and with it saw a massive reduction in the list of pills she now needs to take daily. With our Mum and Granny we are now happy she has more energy but we are also comforted by the knowledge that she is less likely than she was to suffer from various problems as she ages because her body now has the building blocks it needs to replicate her cells safely and without mutation. Hopefully her medical bills in the future will be drastically reduced as a result of this radical overhaul of her diet. If you have an older relative and she/he too is suffering from too much or too little weight, or even, appears to have no weight issues but has a very poor diet and health problems why don’t you too seek the help of a dietician or email me to find out more about this programme and how it works for older people. 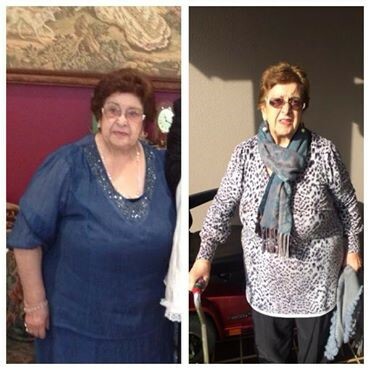 Its never too late – look at the photo of this 73 year old lady who lost 17kg in 4 months using the programme.